Qatar Airways said it will suspend flights from Doha to the Japanese city of Osaka in March next year. Although the airline did not specify the reasons for the decision, other than citing “commercial reasons” for the move, it is thought that the decision is due to slot restrictions at the airport. 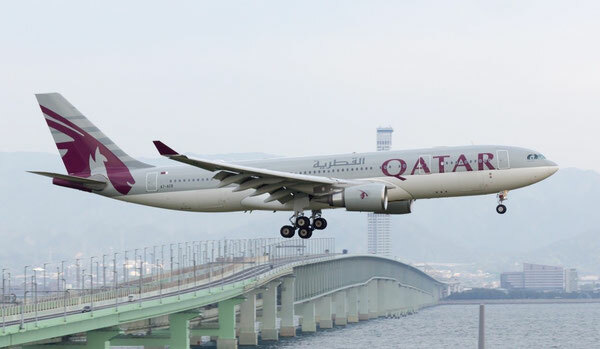 The airline presently operates a daily service between Doha and Osaka, but said it would reduce the frequency to five times a week from January 12 and halt the service completely on March 31, 2016. Up to now, either A330s or Boeing 777s are deployed on that route, both capable of carrying large cargo volumes in their holds, specifically the Triple Sevens. The forthcoming suspension of the flights will reduce available cargo capacity on that specific sector to the detriment of customers. The daily service to Osaka was first launched in 2005, followed by services to Tokyo-Narita and Tokyo-Haneda in 2010 and 2014 respectively. The airline said it would continue operating flights to the two airports in Tokyo. Earlier this year, press reports speculated that the Gulf carrier was considering stopping flights to Japan due to slot restrictions at the airports. However, Qatar Airways denied the reports and stressed it remained committed to the Japanese services. Cancellations are rare for Qatar Airways and its regional peers Emirates and Etihad, a report in the Albawaba newspaper noted. The three airlines have historically enjoyed strong economic benefits from most of their routes, helping them to further boost capacity. In fact, Qatar Airways launched a number of new routes this year including to Amsterdam, Zanzibar, Faisalabad, Sialkot and Multan and Abha. The Qatari flag carrier is also planning to launch flights to Durban in South Africa and Nagpur in India before the end of this year. In 2016, Qatar Airways will start services to three new destinations in the U.S. - Los Angeles, Boston and Atlanta - as well as two new destinations in Australia - Sydney and Adelaide - and Birmingham in the UK, and Ras Al Khaimah in the UAE.